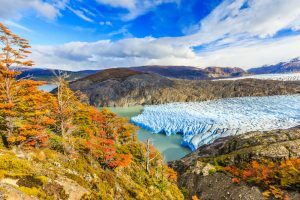 Towering granite peaks, massive crystal blue glaciers, and some of the most spectacular national parks in the world make Southern Patagonia an unforgettable playground for all types of outdoor enthusiasts. 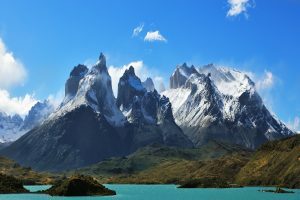 Situated in the Andes Mountains on the border of Chile and Argentina, the unparalleled natural beauty of the region make it a truly distinctive destination. 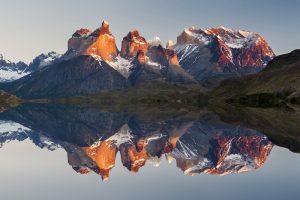 Torres del Paine, Spanish for "towers" and indigenous for "blue," is a celebrated national park in southern Chilean Patagonia. In 1880, Lady Florence Dixie, one of the areas earliest tourists, dubbed the towers "Cleopatra's Needles." 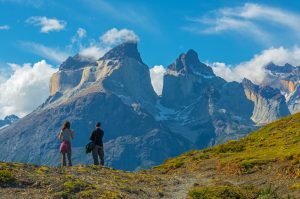 Some of the parks most iconic sites are the three granite towers from which the park takes its name, and the famous horn-shaped peaks called Cuernos del Paine. The "W" trek is perfect for physically active travelers who seek a challenging hike with breathtaking backdrops. Our "W" routes range from 7-8 days, or you can opt to take the 10-day full circuit route. This trek is beloved by all who travel it for the sheer beauty and diversity of the scenery. Picturesque lakeside reflections of the morning sun embracing the mountains are a photographer's dream come true. Around every corner, another impressive vista awaits as you hike from one destination to the next. Dramatic glaciers make their way into deep blue lakes that rest at the feet of soaring, craggy mountaintops. Visit the shimmering waters where Grey Lake meets Grey Glacier, one of the largest glacial ice fields outside of the polar regions. Before dividing in two at its front end, Grey Glacier is 6 kilometers wide and over 30 meters high, making it visible from space. A visit to this frozen spectacle is worth being added to anyone's bucket list, especially because the glaciers of the world are receding. 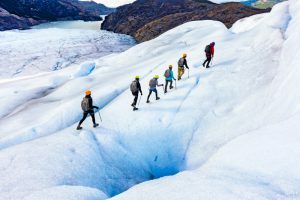 The adventurous trekker seeking the opportunity to have an up close and personal experience with the Grey Glacier won't want to miss our optional ice hike led by expert guides who will give you instructions on proper glacier safety. Ultimate Expeditions provides all extra gear necessary for this excursion so you won't have to worry about packing supplies for this exciting portion of your journey. 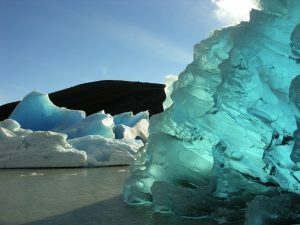 Venture forth and peer into bright blue icebergs that cleave from the magnificent glaciers creating ethereal natural sculptures from the ice that are so artistic you will wish you could take them home with you. You will be amazed by how stunning these natural wonders are when you are standing right next to them. The sheer size and otherworldly color will make you feel like you stepped into a whimsical winter wonderland. 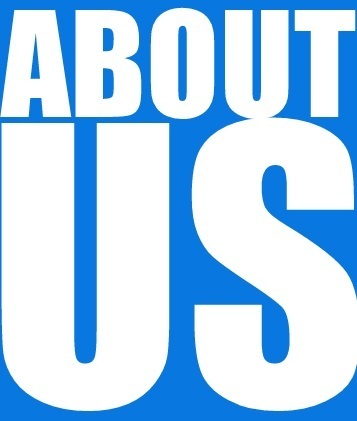 But that is only the "tip of the iceberg" when it comes to what this magical region has to offer! Golden pampas (grasslands) shelter rare wildlife, such as the wild horse herd that has resided in the area for more than a century. It is one of the largest, and last remaining wild horse herds in the world but unfortunately, the horses (locally known as baguales) are at risk of expulsion from the territory that they have made their home. Masters of their domain, this herd that managed to escape domesticity generations ago can be glimpsed wandering the steppe. Watching the baguales gallop along the pampas relaxed and free is a splendid sight to behold leaving many trekkers scanning the hillsides in hopes of spotting them. 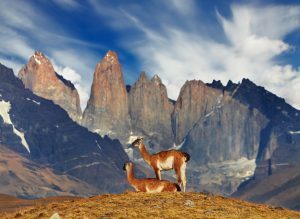 Herds of Llama-like guanacos have also taken advantage of the ample food provided by the lush, Patagonian grasslands. Once hunted for their thick, warm wool, the fuzzy guanacos are related to camels, vicunas, llamas, and alpacas. But don't get too close to these adorable animals, they are wild and have not been domesticated like their llama and alpaca cousins. When they feel threatened, Guanacos have been known to spit. Domestic llamas and alpaca populations of today were most likely bred from their wild guanaco relatives. Depending on the season you choose to visit, you will find the landscapes decorated with visual treats. 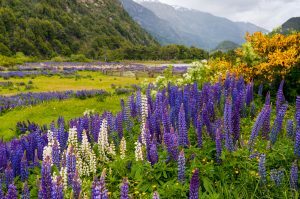 Spring and summer find the hillsides draped with a variety of wildflowers adding a gorgeous splash of color to the already phenomenal scenery. 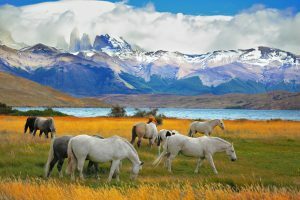 Spring arrives in October in beautiful Patagonia, but the most popular times to visit Torres del Paine is during the warmer summer months from December-March. During the Autumn, which falls during April and May, temperatures may be cooler, but the quieter trails and brilliantly colored leaves provide ample reason to consider venturing from one beautiful orange and red kissed vista to another. Winds, which are infamous for their gusty unpredictability, are also known to die down during the later portion of the trekking season. Regardless of the time of year, your adventure will be an unforgettable one filled with gorgeous sights that are humbling to behold in person. Even though the region is a photographers dream, it is hard to do the wonders of this one of a kind region justice with photographs alone. 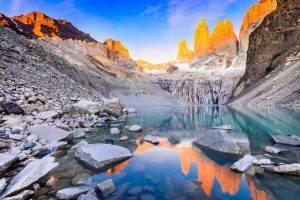 From mirror lakes created by glacial melt, such as Laguna Torres, to grandiose granite spires reaching towards the sky, Patagonia has one perfect place to relax and enjoy the dawn as sunlight rises to kiss the tips of "Cleopatra's Needles," after another. Each day of hiking leads you through unique and varied landscapes. 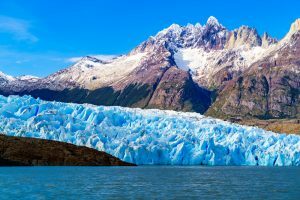 Wandering through unparalleled beech forests, past rushing waterfalls, luminous lakes and gleaming glaciers and even kayaking amongst floating icebergs, will leave you eager to get up each morning to see what splendors the new day has to offer. 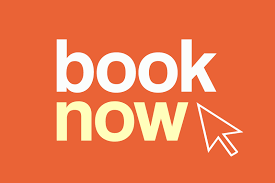 One thing is for sure, whether drawn by the stunning views, the unique wildlife, or the opportunity to adventure through glaciers and ice, the "W" trek will fill your heart, mind, and soul with precious memories that you will reflect on for years to come.